CSRHub is pleased to announce it has formed a partnership with iCompli Sustainability, to offer a new kind of sustainability report – the ESG Metrics Brief – that brings together qualitative and quantitative data for the corporate sustainability marketplace. The ESG Metrics Brief provides concise, yet comprehensive feedback on corporate sustainability performance. The unique benchmarking report delivers quick, easily digestible information on over 120 environmental, social and governance indicators. The ESG Metrics Brief will help corporate sustainability, procurement and investor relations officers assess performance, identify potential brand and reputation vulnerabilities, and make more informed decisions. 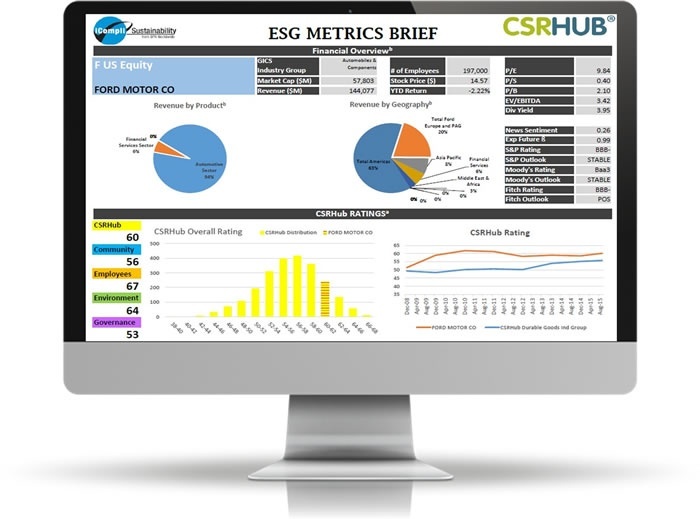 Using the ESG Metrics Brief, stakeholders can see how a company compares with its peers on the CSRHub rating system as well as other leading public and private sustainability scoring frameworks, including Bloomberg and CDP. The report examines a company’s current performance on key indicators such as GHG, water, waste, injury rates, women in management, a company’s progress over time, and industry averages. To learn more, go to www.csrhub.com/content/icompli-csrhub-esg-metrics-brief/. CSRHub® provides access to the world’s largest corporate social responsibility and sustainability ratings and information service, covering 15,000+ companies in 132 countries. 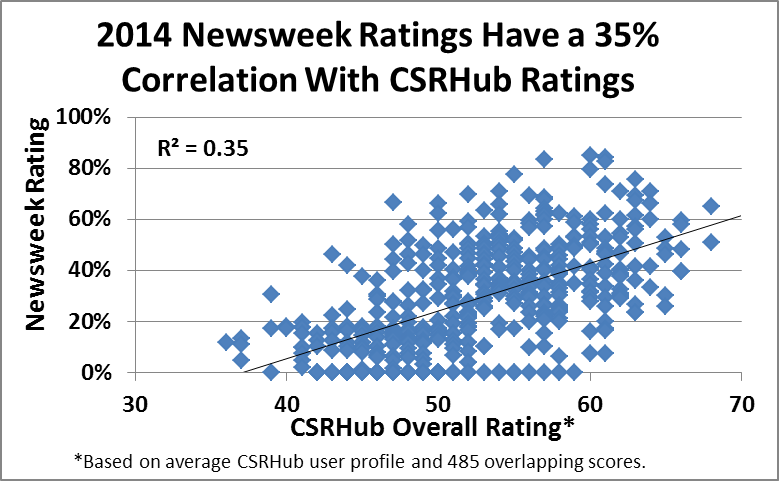 By aggregating and normalizing the information from 400+ data sources, CSRHub has created a broad, consistent rating system and a searchable database that links millions of rating elements back to their source. 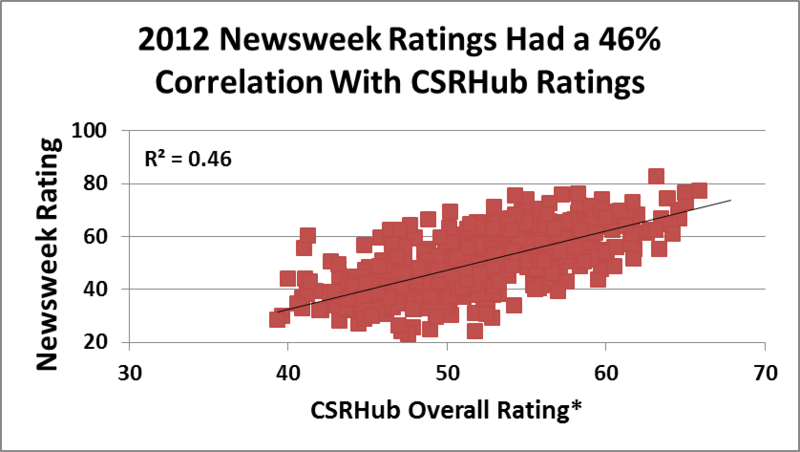 Managers, professionals, and academics use CSRHub to benchmark company and supply chain performance, learn how stakeholders evaluate company CSR practices, and seek ways to improve corporate sustainability performance. Subscribers can access 12 indicators and millions of detailed data points on employee, environment, community, and governance performance. CSRHub is a B Corporation. For more information about CSRHub, visit www.csrhub.com or contact sales@csrhub.com. iCompli Sustainability (iCompli) is a division of BPA Worldwide, the world’s largest media audit company. A not-for-profit organization established in 1931, BPA’s audit services have expanded to include external assurance of government and industry standards and independent verification of companies’ sustainability claims. iCompli provides a research-driven systems approach to help organizations make defensible decisions about their sustainability initiatives. We offer diagnostic and assessment services, data verification and report assurance, and third-party certification to industry sustainability standards. For more information about iCompli, visit www.icomplisustainability.com. At the Apple earnings call last week, CEO Tim Cook reported Apple’s latest record- breaking results and the strongest March quarter ever, with 27% revenue growth and 40% earnings growth year over year. Tim Cook has become the passionate poster child for green electronics, touting environmental progress even with shareholders groups that may not be cheerleaders. And his operations department is implementing good works, eliminating emissions in new and existing Apple buildings, removing toxins from production and sourcing sustainable forests for packaging. Just as important, Apple’s brand communications support its environmental efforts. Apple’s web site’s Environmental Responsibility touts both its green philosophy and its concrete actions. Cook intones on an Apple web video called “better” that “Climate change is real and a real problem for the world” and boasts that 94% of its corporate facilities and 100% of its data centers are now powered by renewable energy such as solar power. Is Apple, now the world’s biggest company by market capitalization, finally leading corporate citizenship too? And doesn’t this just make Apple more vulnerable to environmental critics? In fact, Apple is more vulnerable. An analysis in Huffington Post of Apple’s own 2014 report on climate change efforts reveals that “manufacturing (mostly in China) accounted for a whopping 73 percent of the company’s 34.2 million metric tons of greenhouse gas emissions.” Only 1 percent of the company's emissions are connected to its solar-powered headquarters and data centers. Bloomberg’s Adam Minter recently attacked Apple for the same thing, noting that other companies like Boeing and GM already have factories powered by renewables. Apple is a laggard even among technology companies. Working with BSR, HP has developed energy-management action plans for 20 supplier factories in China. IBM now requires its nearly 20,000 suppliers to chart their emissions and energy consumption and develop plans for reducing both. Apple has joined the Electronic Industry Citizenship Coalition but has yet to announce specific targets. 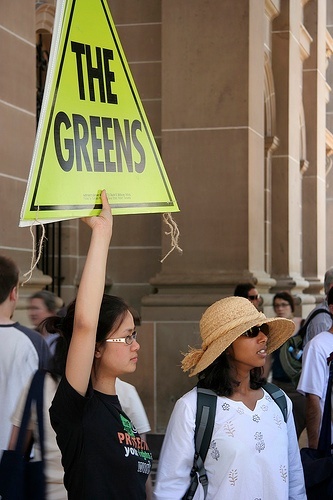 This suggests that Apple is engaged in, if not green-washing, then selective reporting. Apple may be late signing on to corporate citizenship, but it’s just in time. The maker of Macs and iPhones has for years had success using fabulous design and cool chic to ride roughshod over environmental critics and techie complaints about closed systems. 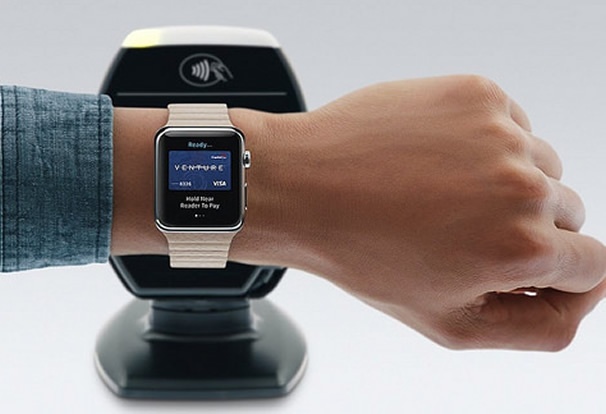 Now, the company is entering consumer payment systems (Apple Pay) and health care information (HealthKit), markets where trust is absolutely paramount. These products lock consumers into Apple for their money and their health, and what could be more personal? Apple is selling to a generation whose purchases are, more than ever, guided by a company’s environmental actions. Six in ten 16- to 20-year-olds (“Generation Z”) say they will go out of their way to buy products and services from businesses they know are helping to create a better world, up from five in ten among Gen Y. And a post-2008 crash McKinsey study noted the widespread perception that financial services have violated their social contract with consumers, leaving space for a trusted source in consumer wallets. Apple needs creds as a corporate citizen to succeed in this new arena. An honest and aggressive commitment is required. In Apple We Trust? See more on Cynthia Figge's chapter in the book Trust Inc.